Sekiro Shadows Die Twice is coming soon, here's our look at the stand-out features and preview of the game. Today I’m taking a look at the big Sekiro Shadows Die Twice features as the game heads to PS4, Xbox One, and PC very shortly. Plus, I’ll be giving my thoughts on the potential of this action-adventure title as we head closer to the Sekiro Shadows Die Twice release on Friday, 22 March 2019. There’s plenty of differences in Sekiro to your usual From Software experience, including a more exploration feel. Enjoy checking out those below. You’ll also be able to enjoy plenty of trailers and gameplay as you go. For those of you out there who love a bit of the Souls series, or even the PlayStation exclusive Bloodborne, you might be in for a surprise or two with Sekiro. This isn’t quite the same as those titles. Sekiro is going to be more about action-adventure gameplay overall. There are RPG elements to the game but these feel far more like an adventure than lists of stats. While there are very familiar elements here too, including the Sekiro version of Bonfires. One key feature is a focus on the exploration of this world and opening up the story as you do so. You’ll be using your grappling hook to zip around faster which looks a lot of fun. Plus, keeping hidden is also a key factor in the gameplay. You’ll be leading your main character, The One-Armed Wolf on this adventure around this beautiful world. With a central hub called The Dilapidated Temple as your base. Very literal naming going on as you can see! Getting there will use either items or Sculptor’s Idols (these are not bonfires… they do exactly the same job… but they are something new, honest!). Once here you can upgrade your arm and its abilities along with other upgrades to Wolf. But getting out and finding out more by eavesdropping on enemies or just finding hidden locations is going to be the main driver in Sekiro. No, this is no classic with Harrison Ford looking for the One-Armed Man (The Fugitive for you younger readers, amazing film). This is the tale of The One-Armed Wolf set in a re-imagined 1500s Sengoku Japan. The character is not only disfigured, losing a limb, his also in disgrace which is going to be explored in flashbacks during the experience. Rescued from near death and given a prosthetic arm, you are out to rescue a kidnapped Lord who you have been sworn to protect. Just how this all these link together we’ll find out in the game. We can assume nothing will be overly clear, I don’t see this being a neat and tidy story. You are going to have to work to understand what has happened in full I imagine. However, we do know you are no longer a silent protagonist. Wolf will be voiced in the adventure during story sequences. The world itself is dark and on the edge of the end. This is not a nice place or time period in this version of Japan created by From Software. Everything will be out for you here, survival will be tough. Yes, we have a more exploring game with less of the RPG elements. And we have a story to follow with a cool, voiced protagonist. But of course, we have some blood spattering combat to enjoy too. Damn does it look brutal! Your primary focus in the game is sword combat combined with abilities linked to the prosthetic arm. To make things ultra-focused on this, there will not be new weapons or armour to collect. Only upgrades to your arm are the big feature here. Combat though will feel familiar as you take on enemies in a strategic, very careful way or you’ll soon end up dead. 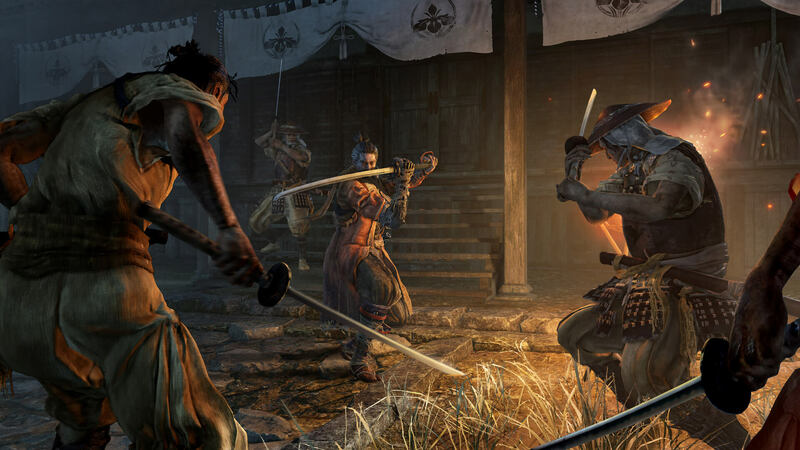 Countering moves as they are about to hit, parrying or simply getting out of way are your friends in Sekiro. But the two most interesting element I’m personally looking forward to are how the prosthetic arm attachments work. Plus how many varieties there are after seeing some very different ones in demos so far. Spears, shields and axes are just a few options seen plus the ability to launch ranged attacks too. The variety here could be what replaces the lack of flexibility in the main weapon, so I do expect there to be a good amount to choose from. All seemingly different enough to change the gameplay significantly. Secondly, I like a bit of stealth so I do hope the promised feature makes it enjoyable to take down plenty of enemies on the quiet where possible. From Software come synonymous with two words: “YOU DIED”. I don’t see that changing too much here in Sekiro to be honest, be ready to read that a lot. While there are more friendly aspects to the game being more action-adventure based. When the fighting starts, the game has been promised to exceed the difficulty of Souls and Bloodborne. Plus, the new game plus feature to make it even harder is back too. To lead you to your many deaths are the monsters of this world. While some are looking rather fantastical, there are many boss battle with more human looking opponents. These are twisted and corrupted versions of themselves though, and will take some stopping. Fortunately you have an interesting ability in Ressurection should you die in battle. This brings you back quickly near where you died as a quick second chance. However, death while in this state is the end and losing here will cost you big. Many items and progress is lost once you die after revival so you have to be careful and get to safety as soon as possible. 1 Skill Trees & Grinding! Sekiro is going to be hard guys! There might be more options like stealth kills and using your traversal more. But, ultimately this is going to be a tough game and a long one too. To help you survive you are going to need some serious skills! These are more in the action-RPG mould than the full on stats used in other From Software games. You are who you are, therefore the game is classless and you can upgrade based on how you see fit. This awesome breakdown on RankedBoost here has a load of detail on the Skill Trees. These break down into Prosthetic, Shinobi and Ashina Arts. Prosthetic arts are all to do with your arm abilities that really do mix things up in the gameplay. These include the grappling hook, special attacks and boosts. Shinobi arts are all to do with your combat ability and Ashina arts appear to manage how you can be more strategic in battle with parries and counter-attacks. Considering the effort it’s going to take to beat the game, the enemies and get these skills, there is going to be plenty to do in Sekiro even in the base game. Just be ready to grind out that XP! I’m not a big Souls fan personally but I did enjoy Bloodborne when it releases. Plus the gameplay in From Software brings something different, especially in a more story-driven, action-adventure setting. I think this could go down as one of the best new IPs we see this year too. It’s certainly a win that this is available to both PlayStation 4 and Xbox One owners along with PC players. It looks like it might take the From Software team in a different direction. I certainly like story driven titles so I really do hope they nail that part of the game. Do not let this fool you however! These is no Assassin’s Creed or traditional open world action adventure. This game is going to be hard, potentially harder in some ways to the other titles in From Software’s library. If you are not a fan of some of From Software’s game, this might bring you in a bit more. But while you are in, expect to get killed. Expect to get frustrated and nothing will be that easy once you are going. Fans of the game will also be left happy to know there is going to be even harder experiences to be had once you do new game plus. But, it will still remain somewhat chalk and cheese in it’s difficulty. If you are up for the challenge, I’m certain the gameplay will be great, perhaps frustrating at times but it will be worth the effort. If they get the story and the open world correct I can’t see this being anything but a great title. One that SoulsBourne fans will be pleased with but might just win over a few new ones as well. Will you be getting Sekiro Shadows Die Twice? After all that, what do you think? Are you picking up Sekiro Shadows Die Twice when it comes out? Which feature stands out most and why? Get in those comments and let me know.